Extraordinary shoppers deserve even better rewards. What if every time you passed through checkout, you received rewards that could be used to fill your tank? Well, as a Rewards member, you can earn points redeemable for free groceries and gas discounts just for shopping at your Market Street store! Sign up for a Rewards account, visit your Market Street store and fill your shopping basket with all the items on your list. Rack up a point for every dollar you spend at checkout—it’s that easy! Claim a reward for every 100 points or stack your points for more savings at checkout or at the pump! Take Your Perks to the Pump! Redeeming your fuel discounts is as simple as typing in the phone number associated with your Rewards account. Redeem your fuel discounts by typing in the discount code found on your store receipt or in the United Texas app! Pump will apply the maximum discount available at the time of purchase. Free stuff? Yes, please! Look for specially-marked Rewards items throughout the store and tell your cashier how you want to use your points. Buy ten, get one free! Your eleventh cup is on us when you use your Rewards account. *Not available at in-store Starbucks locations. We reward you for being our guest; you tell us how. Add our Rewards clubs to your Rewards account to get exclusive offers and access to a community of experts for all the products you love. Earn bundles of Rewards for your bundle of joy with special offers, in-store events and birthday surprises. We look forward to helping you save on the items you need to raise a happy baby. Our just-for-kids club offers exclusive Rewards to our junior guests with invitations to come out and play at in-store events, monthly newsletters, coloring contests, birthday surprises and a free piece of fruit while they shop! Bottoms up! See what’s brewing in the world of craft beer with our monthly newsletter, including a few of our top picks, exclusive discounts and suggestions for tasty pairings. Calling all wine connoisseurs! Our monthly newsletter decants industry trends, primo pairings, flavor profiles and exclusive offers to help our community of fellow enthusiasts find new ways to enjoy fine wine. Sit, staaay and take advantage of tail-wagging offers with exclusive savings on everyday pet care products, special events, bonus points on items your pet loves, and a special treat for their birthday. Access Your Rewards on the Go! *MAXIMUM GAS REWARD AT PARTICIPATING CHEVRON OR TEXACO STATIONS IS $1 PER GALLON OF CHEVRON OR TEXACO BRANDED FUEL AND $1 PER GALLON AT UNITED EXPRESS, SAFEWAY, CARRS/SAFEWAY, TOM THUMB, RANDALLS, VONS, AND ALBERTSONS GAS STATIONS. Points are earned based on whole dollars spent on eligible purchases (for example, spend $5.25 and earn 5 points). 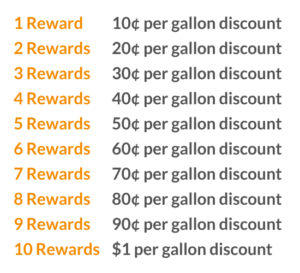 Points are redeemed in increments of 100: 100 points = 10¢ per gallon Gas Reward, 200 points = 20¢ per gallon Gas Reward, 500 points = 50¢ per gallon Gas Reward, 1000 points = $1 per gallon Gas Reward. Point totals less than 100 expire at the end of the calendar month in which they were earned. Gas Rewards earned during each month can be used through the end of the following calendar month (for example, Gas Rewards earned in January expire at the end of February). Savings are limited to 25 gallons for one vehicle per transaction—subject to rounding for Chevron or Texaco in-store fuel transactions and/or transaction dollar limits on your payment card set by your financial institution. Gas Rewards eligibility must be established before pumping fuel to be able to redeem Gas Rewards in that transaction. Gas Rewards are available for use at participating Chevron and Texaco stations approximately 4 hours after earning them. Gas Rewards may be redeemed only at participating Chevron and Texaco stations and at United Express, Safeway, Vons, Randalls, Tom Thumb, Albertsons and Carrs/Safeway branded fuel stations (collectively, “Albertsons Companies Banner stores”). Eligible purchases exclude: (1) beer, wine and tobacco (and spirits in certain states); (2) fuel and automotive services; (3) bus passes, commuter passes, fishing or hunting licenses, ski passes, postage stamps, lottery tickets, amusement park passes, and event tickets; (4) any financial instrument that can be redeemed for goods or services at participating Albertsons Companies Banner stores – including (but not limited to) gift certificates, money orders, and gift or debit cards issued by American Express®, MasterCard®, Visa®, NetSpend®, PayPower™, Green Dot®, Univision Mastercard®, or any Albertsons Companies Banner store; (5) mobile phone cards; (6) Chevron and/or Texaco gift cards; and, (7) all fluid items in the refrigerated dairy section—including fluid dairy substitutes. Sales tax payments and redemption value deposits are not purchases and are not eligible to earn points. Only out-of-pocket pharmacy costs (for example, prescription co-pays) are eligible to earn points. Fast Forward and SmartCheck are not accepted as forms of payment at Chevron and Texaco stations. All trademarks are property of their respective owners and are used with permission. Program may be discontinued or changed at any time without notice. Online and in-store prices, discounts, and offers may differ. Void or subject to restrictions based upon applicable law.